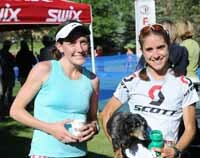 Morgan Arritola has been chipping away and chipping away, and the Ketchum endurance ace finally achieved the Elephant's Perch Backcountry Run 10-mile women's record on Saturday, July 16. In fact, she very nearly broke one hour. U.S. Nordic Ski Team racer and 2010 Olympian Arritola, 25, won her fourth consecutive Backcountry Run women's 10-miler in her best-ever time, 1.00.31. She was sixth overall of 171 finishers with a pace of just over six minutes per mile. She improved by two minutes and 50 seconds compared to last July's victory. In all, 264 runners joined the morning fun Saturday at 16.5-mile and 10-mile distances at Fox Creek. Arritola shattered the seven-year-old 10-mile record of Johanna Olson (1.02:21) by one minute and 50 seconds. And she stamped her name on the 10-mile honor roll by winning for the fourth time. There were 25 different 10-mile women's winners from 1981-2007 before Arritola took control of the race. It's been quite a year of trail running for Arritola. Last September Arritola became the only woman to break the 40-minute barrier in the Baldy Hill Climb since it began in 1979 with a 39:53 effort for her third Hill Climb triumph. Speaking of defending champs, Boise's Joelle Vaught, 36, became a six-time 16.5-mile women's champion by winning Saturday's long distance race in 2.12:00, good for eighth place overall of 93 finishers. It was Vaught's second-best time as she won for the third straight year to go with 2004-06 titles. Only Bellevue's Cindy Mann and Boise's Michelle Jensen have also won six 16.5-mile Backcountry Run titles to date. Another highly-regarded Ketchum-based cross-country skier, Mike Sinnott, seized control of Saturday's men's 16.5-mile race and won by over two minutes over Salt Lake City's Joshua Steffen and by nearly four minutes over defending champ Brad Mitchell of Hailey. Sinnott (1.50:00) improved by over three minutes from last year's second-place finish to Mitchell and posted the third-fastest winning time since the new 16.5-mile course came into play in 1995. Sinnott also won the event in 2008, at 1.51:21. The 10-mile men's winner was Gus Pelican, 25, of Mill Valley, Ca. in 59:09, 27 seconds ahead of runner-up Ben Stout, 17, of Bellevue. Stout is an incoming Wood River High senior and one of Idaho's best prep distance runners. Stout improved by over four minutes compared to his seventh-place result in the 2010 10-miler. Other local 10-mile class winners were Mali Noyes, Daryl Fauth, Tiffany Larson, Will Raff, Georgie Montgomery, Carrie Heagney, Laura Johnson, Cyndy Garvin, Karl Wadsack and Diana Wadsack. Local 16.5-mile class winners included Brad Mitchell, Ted Stout, Chase England, Kristin Smith and Kathy Morell. Among Saturday's best time improvements over the 2010 races were Chase England 11:30 at 16.5 miles and Nicole Kashino 9:53 in the 10-mile event. July 16, 2011, the 31st annual 16.5-mile and 10-mile runs sponsored by The Elephant's Perch of Ketchum. There were 93 runners completing the long course (43 female and 50 male), while 171 runners conquered the 10-mile route (96 female and 75 male), for a total of 264 runners. Of that total, 79 were local (30%), meaning that 70% came from out of the valley. Age range was 13 to 82. Finishing times are listed in hours, minutes and seconds, with age listed after name. Class finishes in parentheses. 16.5-mile run—Sam Collier 16:35, Chase England 11:30, Ted Stout 8:02, Richard Knowles 7:20, Abbie Harris 7:11, Kent Ness 6:21, Kent Aasa 5:14, Sandy Epeldi 4:40, Mike Sinnott 3:04, Kathy Morell 2:41, Tizz Miller 2:19, Katie O'Shea 1:58, Keith Donahue 1:03, Kim Fluetsch 0:48 and Steve Vaught 0:40. 10-mile run—Amber Nebeker 28:50, Jerry Stewart 18:50, Nicole Kashino 9:53, Erin Burke 8:00, Matt Burke 7:31, Heather Price 5:31, Luke Pletcher 5:06, Wendy Sand 4:45, Ben Stout 4:10, Erik Fagerstrom 3:03, Morgan Arritola 2:50, Duane O'Reilly 2:00, Tanya Greenwood 1:32, Miles Fink-Debray 1:22, Daryl Hegerle 0:56, Gretchen Hurlbutt 0:55, James Paris 0:54, Mike Burke 0:47 and Paul Creighton 0:23.